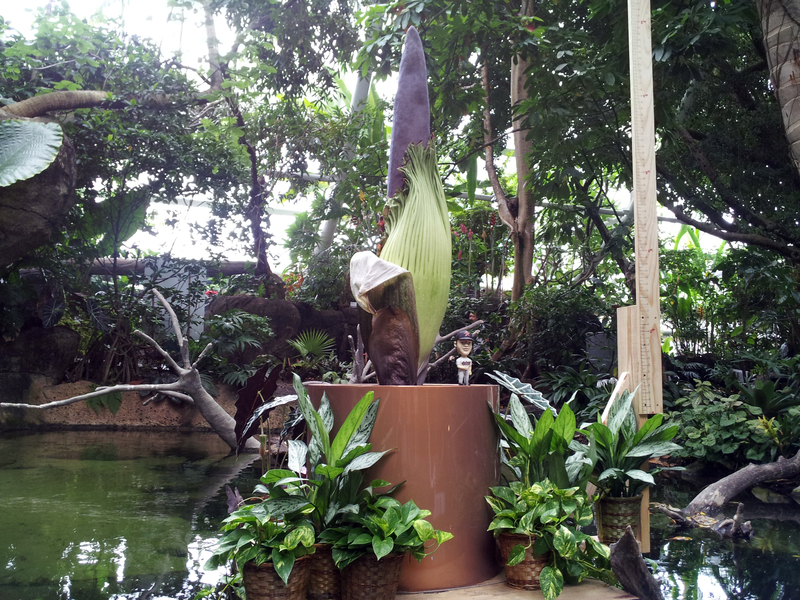 Corpse Flower, “Morticia” Intrigues Guests with Two-Day Bloom and Powerful Stench. Galveston Island, TX (June 14, 2012) — The odor of rotting flesh has never smelled so sweet as “Morticia,” the Giant Corpse Flower officially started to bloom in the evening June 13 at the Moody Gardens Rainforest Pyramid. With a short blooming period of 2 to 4 days, visitors have the rare opportunity to see and smell the Amorphophallus titanum. Native only to Sumatra, Indonesia, it is not only rare in its native habitat, it is extremely rare in cultivation. Fewer than 85 Corpse Flowers have ever bloomed in the United States. 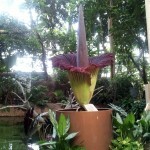 Measuring in at 56 inches tall and 40 inches in circumference, this bloom is only the fourth in the state of Texas. Visitors can expect to have their breath taken away in more ways than one. The common name, Corpse Flower, originates from the unpleasant odor the plant emits during flowering. The strong smell that is similar to rotting flesh attracts its pollinators, carrion beetles and sweat flies. 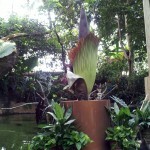 It is considered the largest flowering plant in the world, often reaching heights of over 10 feet tall. Technically, it is the largest unbranched inflorescence, containing both male & female flowers. The plant has a very unpredictable blooming schedule. There is no bloom season and flowers can be produced at any time of year. The Corpse Flower grows from an underground tuber which can weigh up to 200 pounds. A single large leaf that resembles a small tree emerges from this tuber that can grow to more than 20 feet tall. During this vegetative state, the tuber gains energy to produce the massive bloom. The plant then goes into a dormant period for approximately three months. The tuber will then either produce another leaf or a flower as it has at Moody Gardens. Once the tuber breaks dormancy and begins to send up a flower spike, the plant will usually bloom within four to six weeks as it did at Moody Gardens. 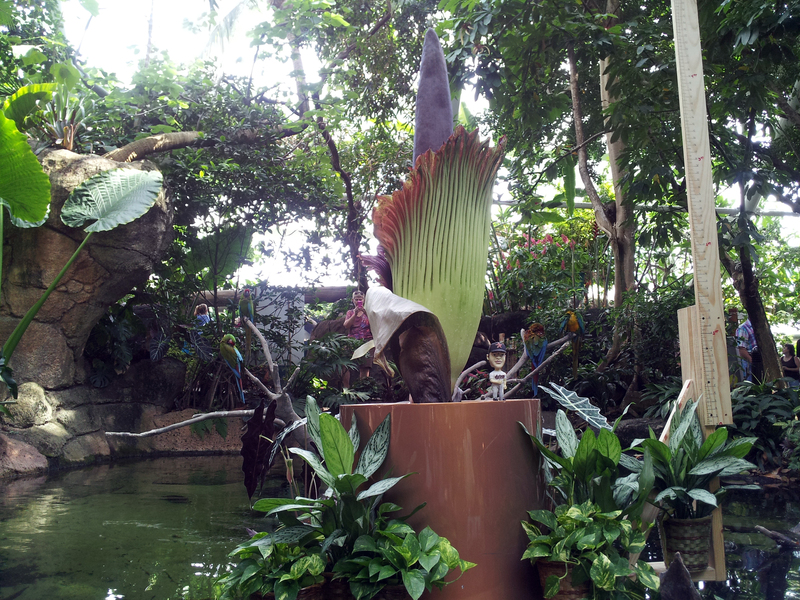 There are six other Corpse Flower tubers in the Rainforest Pyramid. Brannon hopes to see some of these plants bloom in the future. 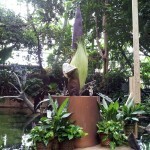 The Corpse Flower was first discovered in 1878 by an Italian plant explorer Odoardo Beccari. Upon initial discovery, the plant struck fear into Beccari’s team due to the plant’s tremendous size and smell. It was believed to be a man-eating plant. Beccari took seeds back to the botanical gardens in Florence, Italy and later sent seedlings to The Royal Botanic Gardens at Kew in London, England. 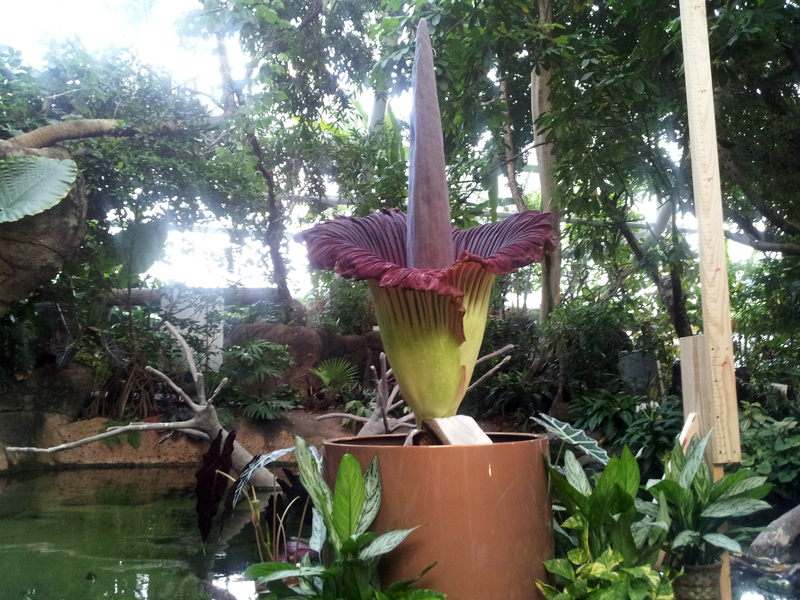 The first recorded bloom of the Corpse Flower took place at Kew in 1889. Police had to be called in to control the crowds of people who came to see it. The first bloom ever recorded in the United States took place at New York Botanic Garden in 1937 where it created a similar response. The same plant bloomed again in 1939. In May 1998, the University of Missouri at St. Louis had a bloom and was the first in this country in nearly 60 years. Due to the plant’s peculiarity, popularity and incredible appeal to growers and collectors in the botanical community, the Corpse Flower began to gain attention in again the 1990s and early 2000s. Since May 1998, there have been 84 recorded blooms in the U.S. at arboretums, botanic gardens, zoos and universities. Thursday, June 14: 10 a.m. – 10 p.m.
Friday, June 15: 9 a.m. – 10 p.m.
Saturday, June 16: 9 a.m. – 10p.m.